My First CSA Box From Basket of Life Farm! 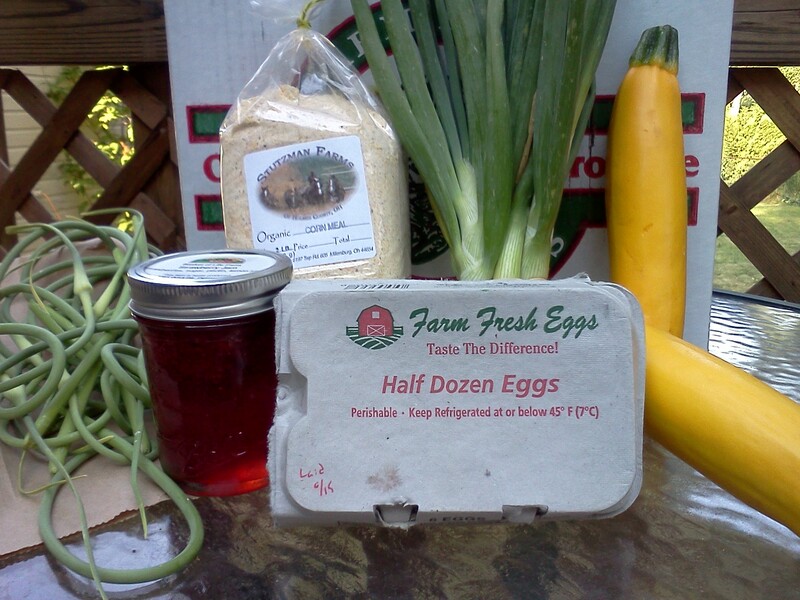 Goodies from Basket of LIfe Farm! So today I went to Basket of Life Farm to pick up my first CSA box. I had no idea how close to me the farm was – less than 10 minutes away! The people are friendly and the farm is great. Just behind the “sorting shed” where the CSA pickup is, I could see tons of chickens just happily running around. Now, they say that the first box is always the smallest, so Heather at Basket of Life Farm told me that she made all the CSA folks homemade strawberry jam for a little something extra in the box. The box also included a half dozen eggs from their chickens, garlic scapes, adorable little onions, a bunch of yellow squash, and a bag of cornmeal. The cornmeal is organically grown in Holmes County at Stutzman Farms. It looks fantastic, and I can’t wait to make some polenta! As soon as I post this, I’m going back to the kitchen to make some compound butters – one with thyme and garlic scapes, and one with sage and green onions. Yummy!! Place the garlic scapes, Parmesan cheese, Asiago cheese, lemon juice, and pine nuts in the bowl of a food processor. Drizzle the olive oil over the mixture. Blend until the pesto is a brilliant green color and smooth in texture. Season with salt and pepper. This entry was posted in CSA, Pesto, Recipe and tagged Basket of Life Farm, CSA on June 15, 2012 by Melissa. Ooh, thanks for the garlic scape pesto recipe. I have a few leftover from last week and my pick-up is tomorrow. What a great way to use them!! And a yummy looking box, indeed! It seems to be sweeter than regular pesto, which makes me think it might be good on shrimp or scallops. Let me know what you think if you try it! I’m really digging the garlic scapes – They’re like a lighter, more summery version of garlic! I think I may make some garlic bread with the garlic scape/thyme butter. I don’t see how that can possibly be bad! I love that you have a Community Garden – so awesome! Awesome! Are those yellow zucchini? Linked up! And I love the idea on your post about making zucchini fries. I usually just grill them with olive oil, salt and pepper, but I want to try something new with these. Thanks! Looking forward to hearing how you like the fries! I am definitely going to make the pesto! And some compound butters too. Kim has made them before because we miss having fresh basil so much, and then we plant too much and can’t possibly use it all! I am so happy that you got Jessica to hook up with us, too. Tom and Jeff, Jessica was Melissa’s first friend and they are still friends to this day. Now let’s find Kara…..
Oh, Kara’s reading the blog too – don’t worry! I would dip those yellow squash in egg and cornmeal and fry them. Yum!